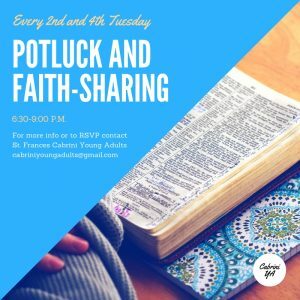 Join us every 2nd and 4th Tuesday of the month for our young adult faith-sharing evening for ages 18 to 39. We meet at St Frances Cabrini in the Parish Center at 6:30 PM. During these evenings we will discuss the Gospel for the Sunday, an important upcoming feast or current events and how they impact our lives as young Catholics. If you plan to come please RSVP with our coordinator Kelsey Ballard at cabriniyoungadults@gmail.com. 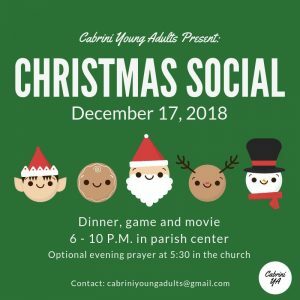 Join us for dinner, game, and movie to celebrate the season! Dinner begins at 6:00 PM December 17th in the parish center. Optional evening prayer (Vespers) at 5:30 in the church. For more information contact cabriniyoungadults@gmail.com.